Tribune "Ukrainian crisis and the Federal State of Novorossiya perspective"
The following is a translation of an article about this public educational, co-sponsored by the Center for Syncretic Studies, which appeared in New Serbian Political Thought (NSPM) Magazine, in Serbia. – The original can be found here: Трибина ”Руско пролеће- украјинска криза и перспективе Новорусије” . It covers last week’s public educational ‘Tribunal’ led by several of Serbia’s geopolitical analysts, for the residents of Sremska Mitrovica. The presentations were given by Milos Milojevic, Joaquin Flores, & Dragana Trifkovic. On Saturday the 17th of January, in Sremska Mitrovica, a panel discussion was held ‘Russian spring – Ukrainian crisis and the Federal State of Novorossiya perspective’ ‘ . 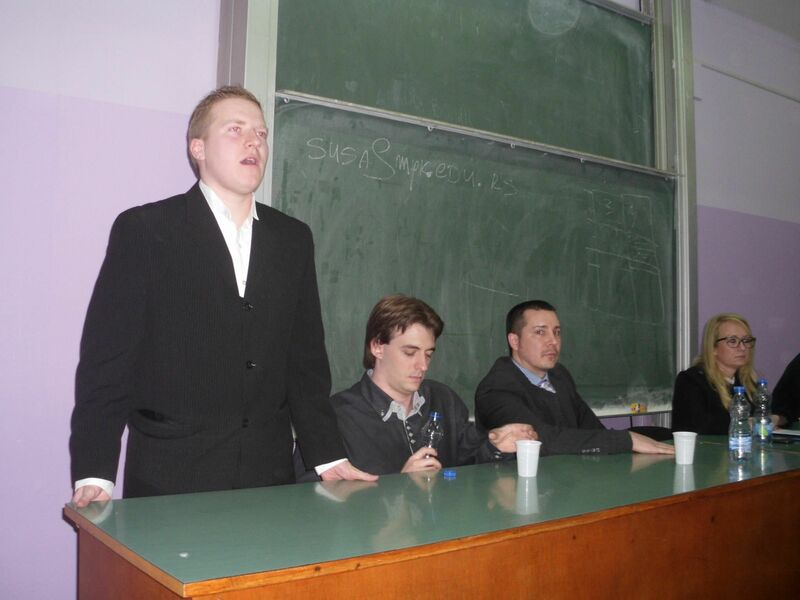 The forum was organized by the historical club from Sremska Mitrovica and the association of the Fire Dragon Wolf was held in the hall of the Teacher’s College. The subject of the forum was the current course of the conflict in Ukraine, the current situation in the Federal State of Novorossiya and prospects for ending the conflict. News in recent days, the renewed fast and powerful wide range offensive of the Ukrainian Army, followed by the almost complete collapse of the offensive effort, showed how the theme of which was discussed Saturday is current. Standing in front of the tribune attendees, first the organizers addressed with the welcoming words of the Трибина ”Руско пролеће- украјинска криза и перспективе Новорусије”. Tesa Tešanović who announced the other speakers.This was followed by the presentation of Milos Milojevic , who spoke about the origins of the Ukrainian crisis in the post-communist development of Ukrainian society ,and the geopolitical circumstances of the war Ukraine.Political changes of dubious origin, which are often referred to as the spring of nations, mainly indicate the violent overthrow of the regime, allegedly trying to overthrow a ‘hated dictatorship’. The term when used in relation to the Federal State of Novorossiya, has a different political connotation – it in fact involves the attempt of the Russian people in the east of Ukraine to protect themselves from the aggressive policy of the government in Kiev, and provide for themselves political rights that the central government should guarantee.According to Mr. Milojevic, the conflict in Ukraine can be divided into several parallel conflicts: the first and most obvious means of events on the ground and fierce fighting between Novorossiyan forces and the Ukrainian Government; the second involves efforts by Russia to preserve its important strategic interests in Ukraine and the third, least visible and probably with greatest consequences, the geopolitical confrontation between Russia and the United States and its Western allies who has plans for Ukraine, just as in almost every other focal area of the world. It is noted that there are dual reasons why the violent demonstrations in Kiev that culminated in the toppling of the regime of Viktor Yanukovych led to the outbreak of the bloody civil war. At the time of the fall of the Yanukovych’s government, much of what is discussed in terms of events escalating the to the level of a full-scale civil war had not occurred. The Yanukovych regime was construction that rested on a weak foundation, and he himself did not dare, although according to his own words was not possessed with appropriate powers, to carry out a counterattack. In addition, Russia has insisted on his survival even gave him refuge. The new regime hoped to achieve acceptable Russian relations, who in turn quickly recognized the newly established political situation. However, the experience of Ukraine’s post-communist transition, which represented a long-term collective humiliation, contributed to strengthen extremist political forces with a strong anti-Russian characteristics. Survival of the representatives of these forces on some of the key positions contributed to the flare-up of violence throughout Ukraine as then conditioned self-defense measures in the east of the country. 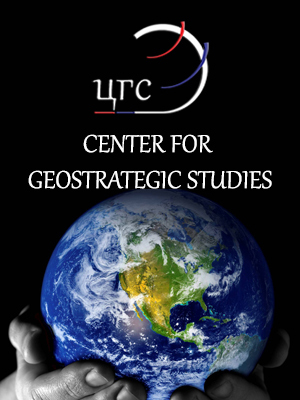 Another cause of the escalation of the conflict is not in the Ukraine but in the United States and their efforts to exploit the crisis in Ukraine in acquiring strategic dominance itself, in relation to Russia’s borders. Specifically, the United States since the beginning of the crisis in Majdan has had a huge, certainly decisive influence on events in the Ukrainian political structures that are now in power in Kiev. Supporting the violent overthrow of the regime and then supporting the most extreme exponents of the new government fits into the broader US strategy which raises a number of questions regarding the geopolitical context of these events. Milojevic said that, in order to understand the geopolitical importance of the situation in Ukraine. we must pay attention to a series of political upheavals that were identified as the Arab Spring. The violent regime shifts in a number of Arab states culminated into years of civil war in Syria, where forces supporting the US failed to overcome the government forces. These plans of the United States in this key geopolitical region were substantially frustrated. Thanks to the successful fight in Damascus, Moscow has acquired the strongest position in the Middle East since the collapse of the USSR. The United States then shifted the focus of the struggle to the very borders of Russia, presumably expecting that Russia will openly interfere in lengthy and exhausting war. When even this did not produce the expected results, it launched an economic war against Russia, which also, presumably, will not be successful. From individual EU states are coming indications that these economic sanctions must be ended, and then there will be no practical means through which the West will be able to put pressure on Russia. Milojevic concluded that perhaps here lies the key favorable outcome in the Russia-Ukrainian crisis because Russia will be able to make a strong economic pressure on Ukraine, whose economy is in a state of disarray, and where there will be compulsion to end the civil war. There followed a presentation Joaquin Flores , geopolitical analyst, director and founder of the Center for Syncretic Studies . Although Flores spoke in English, following his presentation was easy thanks to the excellent simultaneous translation of Novak Draskovic. At the beginning of the presentation, Flores pointed out that the so-called and long used methods of nonviolent resistance was developed by the American analyst Gene Sharp, whose method is applied by Srdja Popovic, infamous for his work in Serbia since 5th October, 2000, and then in a number of countries, including Ukraine. The focus of Flores’ presentation was on the interests and activities of the United States in Ukraine and the implications of these events on the political prospects in Serbia. For the last 150 years there is a tendency that the European and Russian space merge into a single geopolitical space of Eurasia. Great Britain and then the United States, following the key vectors of its geopolitics, created conflicts between the most powerful continental powers from which it itself profited. US benefited in many ways when they convinced European countries to impose sanctions on Russia. One, according to Flores, was to expect a strong Russian response that would be an even bigger strain on Russian-European relations. However, the US-European pressure which followed actually failed to challenge Russia’s counteraction, and in time Russia has managed to avoid the trap that the US had prepared. The mere regime change in Kiev is not the main goal of the United States. According Flores, the US and Russia are both clear that regardless of the nature of government in Kiev and regardless of its rhetoric, it will have to, sooner or later, negotiate with Moscow. 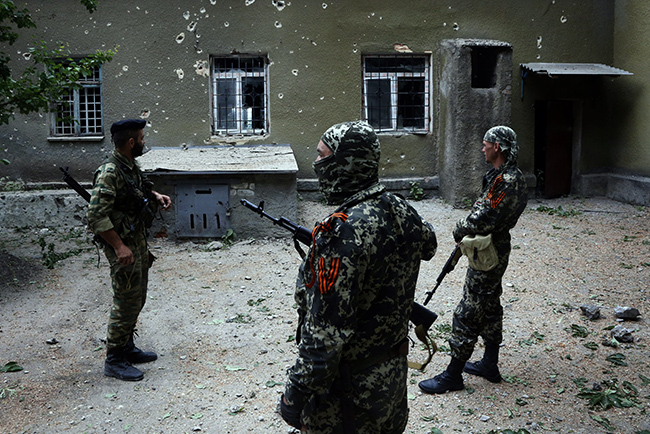 The only chance for the US is that it maintains a constant conflict in Ukraine. The aim of this conflict is permanent destruction of the Ukrainian economy and society. A similar aim is in the current civil war in Syria – that a nation turns into unsuccessful and unstable territory (a failed state) that would destabilize the entire region. Flores said that the Serbs were in a good position to understand what is going on because they have a wealth of experience in the color revolutions and US special operations. In this sense, Serbia with the correct policy can be the center of the western Balkans in opposition to NATO. Flores concluded that at this point it is important that in Serbia to elect a parliament and with those and other forces, can put pressure on the government to resist NATO, and later in perspective, the European integration. The situation is moving in a different direction and we believe that NATO empire is about to collapse, underlined Flores. After this very meaningful and provocative presentation was followed by a brief discussion and Q&A session of interesting topics related to the Ukraine and the political situation in Serbia. The third speaker at the forum was Dragana Trifkovic , president of the Center for Strategic Alternatives and a member of the Political Council of the Democratic Party of Serbia (DSS). Dragana Trifkovic was also an observer at the elections in Donetsk and Lugansk Republic in November last year, and in connection with the situation in Ukraine and especially the Federal State of Novorossiya has published a number of articles, interviews, and comments. This presentation was mainly related to the current situation in the Federal State of Novorossiya, the prospects for its survival and political construction, but also in the development of the situation in Ukraine in general and especially in the Federal State of Novorossiya. Trifkovic at the very beginning of her presentation pointed out that the development of the situation in the Federal State of Novorossiya and in this regard, the strengthening of Russia’s position, is of primary interest for Serbia. In fact, she says, Serbia is occupied and so there is no capacity to defend and liberate from foreign occupation, and its only hope is the eventual strengthening of Russia, and this is contextualized in the conflict in Ukraine in which it must come out the victor. Trifkovic, in her speech, gave direct accounts gathered during her stay in Lugansk as this presentation gave an exclusive. Specifically, with astonishment pointed out that the residents there knew very little about the experience of the conflict in the former Yugoslavia, although these events are in many ways close to what is happening now in the Federal State of Novorossiya. The open military conflict began after Euromajdan, a pretext in Kiev was Yanukovych’s refusal to sign a closer integration with the EU. Military operations began by Turčinov, then acting as interim president, at a time when the cities in the east of the country began protests. The crime in Odessa, which took place on May 2, and which was carried out by extremists, by and large from the right, was an important trigger for the outbreak of conflict in the country. In this bestial crime the extremists of the right sector, hooligans from various Ukrainian cities, members of various paramilitary groups and parasecurity services, routed youngsters who collected signatures for the federalization of States into a building and then set fire to that building in which they had taken refuge. The aim was to discourage all those who were willing to fight for their political rights. However, this incident had accelerated the political developments in the east of the country – were organized referendums in Donetsk and Lugansk where the vast majority of citizens opted not to recognize the competence of the authorities in Kiev. In November, the two most important center of resistance to the Kiev authorities organized and conducted elections. In June, July and August the fiercest fighting was conducted. Kiev government has carried out indiscriminate attacks on populated areas. During the height of the conflict almost the entire population moved out of the cities. This was followed by the reorganization of pro-Russian forces and powerful counteroffensive, which has almost completely blunted the offensive capacity of the Ukrainian power. The Ukrainian authorities have stopped paying salaries and pensions and the supply and survival of the population in these areas is largely dependent on Russian help. Fortunately, during these conflicts the Ukrainian air force was almost completely destroyed and therefore thrown out of the matrix is 60-70% of Ukrainian armies warfare tactics. Until recently in the Federal State of Novorossiya, maintained the fragile truce founded on the agreements reached at the meeting in Minsk. As a basis for dialogue, sthe Law on the special status of Donetsk and Lugansk Republics was signed and thus it was agreed the suspension of hostilities. In the elections that were held in November in Lugansk and Donetsk Republics were more outside observers, including those from the United States and the European Parliament. According to the testimony of Dragana Trifkovic who herself participated in the supervision of elections, the elections were held without incident. From contacts with local people she gained the impression that these elections represented for them hope for a better future and a chance to secure their political rights. Trifkovic concluded her presentation by pointing out in the current situation in the Federal State of Novorossiya – two months after the end of the election were renewed fighting (which continued the previous day) – the Ukrainian authorities are conducting a fourth round of mobilization that includes taxpayers and the oldest ages. Efforts to resolve the conflict with additional forces suggests that it is unlikely to conclude, and that it may become a frozen conflict, and that it may take more years to resolve. In the discussion that followed the debate turned to the audience. with closely monitored developments in the Federal State of Novorossiya, so it was very meaningful and we believe it has helped to create better understanding of how events in the Federal State of Novorossiya, and the implications of these developments in the political position of Serbia. We hope that in the future there will be organized a new discussions on various topical issues, such as it was last Saturday in Sremska Mitrovica, into an interesting political discussion.